The youngest of the national parks, covers an area that is wide and rich with diverse landscapes, valleys marked by migrant sheep tracks, hills covered in olive groves, vineyards and dense woods – the safe habitat of many local animal species. Mountainous sanctuaries, silent towns and archeological areas are the subtle markers of the thousand-year-old presence of man. Traces of the Roman past live again in the magnificently preserved colony close to Grumento Nova, and can be found in the national Museum of Alta Val d’Agri. 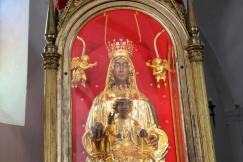 The first Sunday of May the park hosts a unique procession in honor “The Black Virgin” of Viggiano, patron saint of the region. 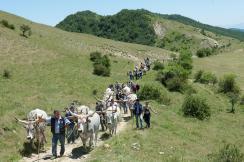 The procession winds its way up to the sanctuary of Sacro Monte, at a height of 1725 meters. A land historically rich with musicians, Viggiano celebrates its muse under portals decorated with sculptures representing the musical instrument played and loved by each household. Those able to enjoy a longer stay have the opportunity to try out our numerous hiking itineraries, cycling routes along the ancient Roman roads, and skiing during winter. Just an hour from the Tyrrhenian coast , the Massiccio del Sirino, 2000metres above the sea level, offers the thrilling experience of skiing while looking out over the blue sea. 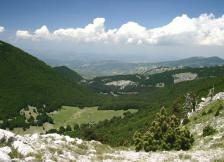 Spanning 192 000 hectares, opening on two seas, the Ionian and the Tyrrhenian, and spilling into two regions, Calabria and Basilicata, Mount Pollino takes the prize as the widest park in Italy. 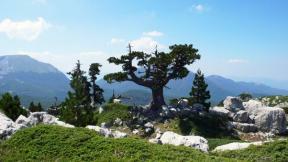 Topped with snow most of the year, Pollino National Park boasts the most dramatic and imposing peaks of the southern Apennines. These mountain slopes are blanketed with splendid woods of beech, silver fir, maple, alder, whose changing foliage make for a spectacular autumn mantle. The area hosts interesting geological phenomena but above all is characterized by old forests of coniferous among which the very rare Bosnian pine (Pinus Leucodermis), symbol of the Park and authentic arboreal monument one can admire in Serra di Crispo, nicknamed The Garden of Gods. The Park’s towns, scenically perched over wide valleys, are home to beautiful historic palaces decorated with portals made of sculpted stone. Throughout the year these towns host religious rituals still strongly linked to an ancient arboreal worship. The nature reserve of the Park encompasses five municipalities that enshrine ancient treasures and preserve century-old custom. 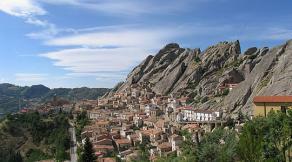 Set in the gorgeous landscape of the Lucanian Dolomites, Castelmezzano e Pietrapertosa stand out for the surreal quality of the rock that seems to be looming. This impressive massif derives its name from the Alp peaks for its unusual orographic formation. A broad network of walking and cycling and driving paths crisscross the park, passing over the rock, and through the Gallipoli Cognato forest and the wood of Montepiano – home to magnificent Turkey oaks reaching 30 meters. Among the most interesting of the many local feasts are those called “ I Maggi” – The Maggi – which express the strong relationship between the Park’s communities and the ancient practice of arboreal worship. 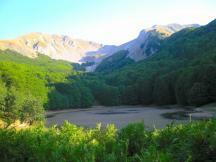 For detailed information on itineraries and peculiarities of the Park, see www.parcogallipolicognato.it. 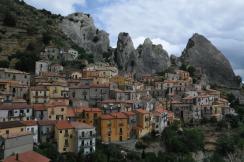 Castelmezzano and Pietrapertosa are recorded among the Most Beautiful Villages in Italy. Matera and Montescaglioso’s municipalities cover a territory of special value, protected by a regional law of 1990 and enhanced by many initiatives organized by Environmental Education Centers. 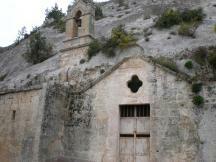 The deep ravines, carved from the calcareous tuff by the Bradano river and the Gravina torrent, are the basis for a very unique environment. 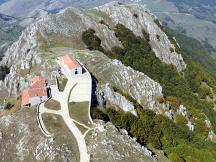 Against a background of patchy oak woods is a network of Neolithic villages, rock churches, cisterns dug out from the rock, sheepfolds, masserias, variety of species of avifauna unique to this biotope. Considered by the Institute of Science and Technology of Light Pollution one of the rare areas where one can admire some of the less visible celestial bodies with the naked eye, the park offers awesome views of the starry vault, particularly enjoyable during the night trips in summer. 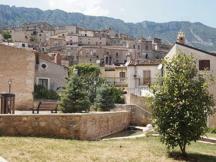 At a short distance from Potenza is the town of Brindisi di Montagna. 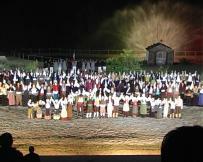 Each summer the town’s historical Park of Basilicata hosts a live exhibition “ La storia bandita” – a reenactment of the history of Brigandage (a phenomenon of social and political unrest which took place in southern Italy after the unification), with hundreds of actors performing this story on the original location, amid the original scenery. To complement this great show are a variety of events featuring local wine, cuisine, craftsmanship, and above all the exciting falconry show. 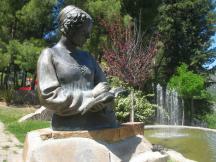 Important moments in literary history draw our attention to the two Parks dedicated to the memory of Carlo Levi, and the park honoring the tragic affair of Isabella Morra. The first two Parks celebrate the figure of the writer from Turin who spent the years of his internment and exile living in Southern Italy. 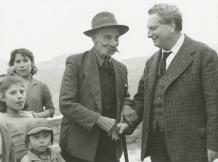 Levi’s famous novel, Christ Stopped at Eboli, describes his experience of being interned in Grassano, and living his exile in Aliano. The third park refers to the sad story of a noble woman Isabella Morra, poet of the XVI century who paid with her life for choosing a lover against her brother’s wishes. 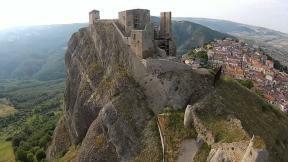 In the summer the castles and villas of the town of Valsinni are transformed to host concerts, shows and exhibitions.